“Totentanz” is co-written by Nancy Holder and Erin Underwood. 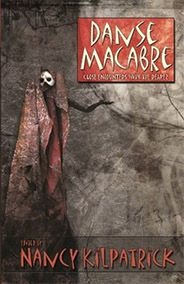 Danse Macabre: Close Encounters With the Reaper could be one of the most unusual anthologies you’ll ever read! Twenty-three literary reflections embody the theme, classical artwork devoted to the spectrum of humanity’s intriguing interactions with the Angel of Death in all of his/her manifestations. Contributors: Brian Lumley, Tanith Lee, Tom Piccirilli, Nancy Holder, Lisa Morton, Brian Hodge, Lucy Taylor and others.